The drape will provide protection from laterally migrating bacteria, because it stays in place even throughout major operations involving prolonged retraction of wound edges. Incifilm® incise Drape is tear resistant, but can be cleanly cut with a scalpel. Incifilm® Incise Drape is very conformable on operation sites, its elastic qualities make it suitable for use where heavy manipulative surgery is involved, for example, in total hip replacement. 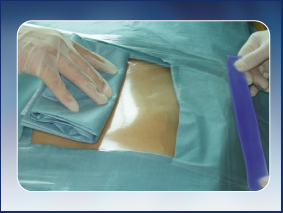 Incifilm® Incise Drape provides a sterile working field, onto which internal organs may be placed without fear of contamination.